I am thinking about participating in a craft show in December–I think it will be fun but I know it will be a lot of work. I realize that I’ll need some smaller items to offer, so I decided to make a test placemat using some time saving steps. 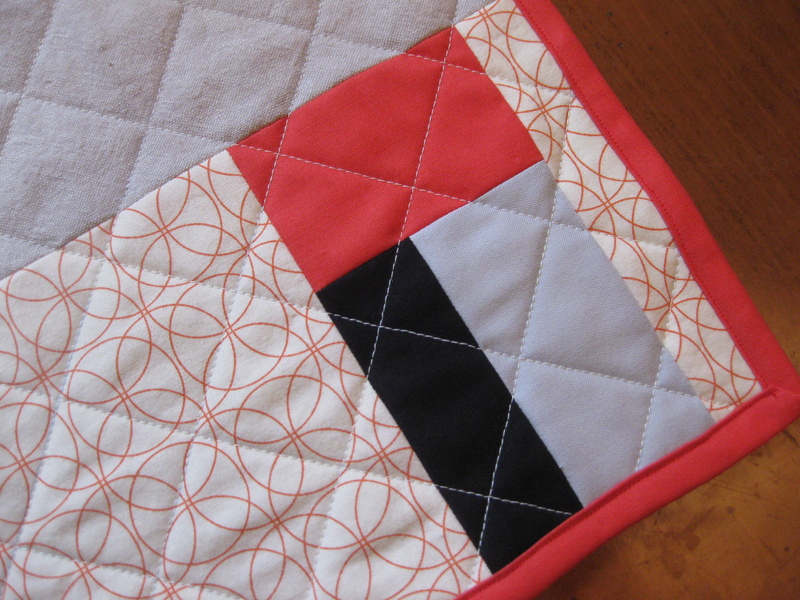 I used an improvised patchwork panel–in part because I really love this style and in part because it is quick. I also tried machine stitching the binding. First, I tried a double binding that was machine stitched rather than hand stitched on the back–without success. The corners were sloppy and I couldn’t catch both sides in an even seam. 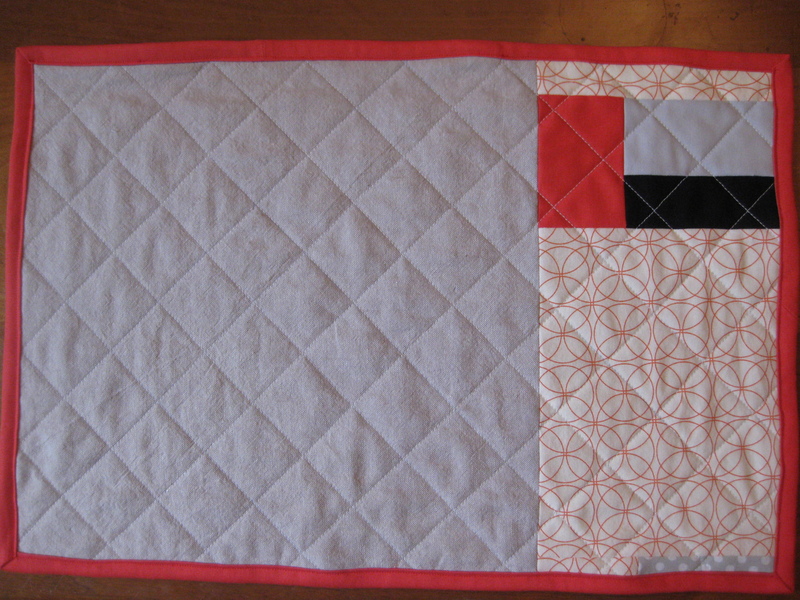 Next, I tried a bias tape method following instructions in Dare to Be Square by Boo Davis. This method was much more successful for me, and it conserves fabric. All told, this placemat took about five hours to make (including trying both binding methods). Am I insanely slow? If I make more, I know they would go much, much faster, but still! If I do the craft show it will definitely be for fun not profit. The fabrics used are: Robert Kaufman, Yarn-Dyed Essex in flax; Kona cotton; Comma by Zen Chic; a teeny piece of Lecien Dots in large gray. This entry was posted in quilts, small projects and tagged craft, linen placemet, patchwork placemat, Quilts, Robert Kaufman Essex, Textile on September 22, 2013 by brigitdermott. Great attitude for a craft fair! I hope I can adopt it for mine this December. The placement turned out very well, and thank you for the links to the binding tutorials. Machine binding really would speed up the process. Thanks for the encouragement! I really like the bias tape method. I wouldn’t use it for a whole quilt because I love the invisible stitches of a double binding. But machine stitching is very durable, which is great for a placemat. Good luck with your craft fair and have fun! Thanks! I pre-washed the linen so I hope that helps. I appreciate the advise!